Television actor Arjun Bijlani will not be a part of Naagin 2. He will be seen in a new show Pardes Mein Hai Mera Dil opposite Drashti Dhami, which is inspired from Shah Rukh Khan's 1997 film Pardes. 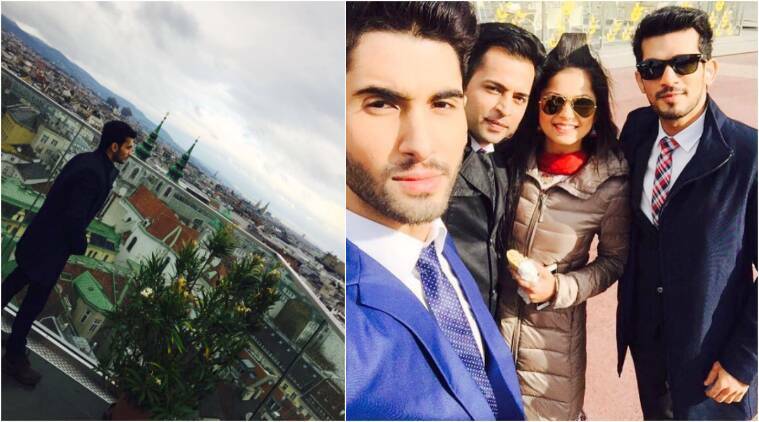 Arjun Bijlani is in Austria shooting for his new show Pardes Mein hai Mera Dil with actor Drashti Dhami. He won’t be a part of Naagin 2. Arjun is not a part of Naagin 2. This news might have broken many hearts, but it’s true that Arjun is not reprising his role of Ritik in the fantasy drama. So how do we get to meet him every day on our screens now? Well, the latest from the heartthrob is that he has been roped in for a new show by Ekta Kapoor yet again. Looks like this man has become the favourite of Ekta’s banner. But who’s complaining till the time we get to see him? Arjun himself confirmed the rumours about his upcoming show. The 33-year-old actor posted some picturesque images from Vienna, where he flew some days back to begin shooting for his latest project — Pardes Mein Hai Mera Dil. And his leading lady will be the beautiful Drashti Dhami. Rejoice! Arjun Bijlani had an interesting stint on the Jhalak Dikhlaa Jaa stage recently. Though he got evicted, his journey was a pretty decent one. And quickly after leaving that particular dance platform, he is back on the sets. If reports are to be believed, his new show Pardes Mein Hai Mera Dil is inspired from Bollywood film Pardes, starring Shah Rukh Khan. Whether that’s true or not, we’ll have to wait till the show premieres. Check out the pictures he shared on his Instagram page. Some images were also shared by fans in Austria. Arjun also posted a video of a local musician whom he bumped into while on the streets of Vienna. Looks like he is into full touristy mood in the beautiful place too. Arjun doesn’t need to try hard to win followers. His charm and good looks have ensured that his fanbase keeps growing. The actor made his debut with shows such as Remix, Left Right Left and Miley Jab Hum Tum. While Arjun has been quite vocal about his new show Pardes Mein Hai Mera Dil, Drashti, on the other hand, has remained tight-lipped. All we got to see of her was in the pictures Arjun shared. Pardes Mein Hai Mera Dil will replace Siya Ke Ram on Star Plus. Its premiere date is still not confirmed.